Over the course of one long day and night, we follow the life of a married couple, Tom and Helen. They moved to the countryside with their young twin daughters after Helen discovered Tom had a brief affair with his boss. Helen still works in advertising, exhausting work and part-time only in pay. Tom is a journalist in the city, waking early – often sleeping on the sofa fully dressed – to commute back and forth each day. Both Tom and Helen are tired from moving, working, parenting, worrying about money and keeping secrets from each other. Helen is angry at how motherhood and moving has isolated her and devalued her. Tom is overwhelmed by the energy it takes to keep his secret hidden. They are worried the people they have become will destroy any last remnants of affection between each other. They are worried they’re not sure if they even care anymore. Small Hours is a frighteningly realistic portrayal of early parenthood. The weight of the little things drag Tom and Helen’s tired minds to the edges of sanity, making them reach out for the easy road, longing for understanding, desperate to rest in each other but too afraid that open communication will destroy their marriage. It also feels as if there isn’t time for their relationship to have a space of its own. I can’t say I enjoyed the book because it isn’t fun to read, it is, however, honest and therefore a little painful; compelling because their worries are both small and life-shattering. How can the thoughts of the small hours be reconciled with the day? What constitutes betrayal? What is really involved in being a good worker, a good spouse, a good parent? Small Hours comes out in December, just in time to nudge readers into new year resolutions they might be able to stick to. 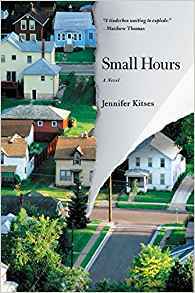 Insightful and awkwardly apt, Small Hours is a portrait of a couples’ struggle to live up to their good intentions, provoking the reader to question what really matters. Next week I’m reading Gnomon by Nick Harkaway.